Reports about arrested priests and closed down churches suggest that the authorities are not prepared to ease on the persecution of underground Catholic churches after the Vatican-China agreement. The provisional agreement between China and the Vatican, signed on September 22, is not bringing together the old-time rivals: the government-controlled Chinese Patriotic Catholic Association and the underground Catholic Church. On the contrary, both sides appear to resist the vision of the united Catholic Church of China. For a long time, the CCP government has refused to recognize the Chinese bishops appointed by the Vatican, and the underground Catholic Church has questioned the legitimacy of the Patriotic Association because of its noncompliance with the religious laws prescribed by the Vatican. With the agreement of September 22, the Vatican has recognized seven bishops of the Patriotic Association it had previously excommunicated. One of them, Mgr Guo Jincai, has even been invited to Rome to participate in the recent Synod. The details of the agreement are secret; and it is unclear whether, in turn, the CCP will recognize the bishops of the underground Catholic Church who have never been part of the Patriotic Association, whether they would be compelled to join the same Patriotic Association as a pre-condition, and, in this case, what will happen to those who will refuse. The aim of the agreement is the gradual merger between the underground and the Patriotic Church, but the path will be long and complicated and the result is far from being guaranteed. In the meantime, the unlikely peaceful co-existence between the underground and the Patriotic Church is even more hindered by the continued persecution of the clergy and believers in the Catholic churches not approved by the government, which, according to reports received by Bitter Winter, are increasing after the agreement has been signed. On September 23, just a day after the signing of the agreement, over ten plainclothes police officers broke into the Longtian Church of Fuzhou, the capital of southeastern Fujian Province. The mass was in progress, and the officers arrested Father Lin Jing’en in front of the congregation. While he was released within hours, as per an informed National Security Brigade (NSB) official, his arrest was pre-planned. The Fujian authorities were waiting for the Vatican-China agreement to be signed, lest their actions create a problem for China. 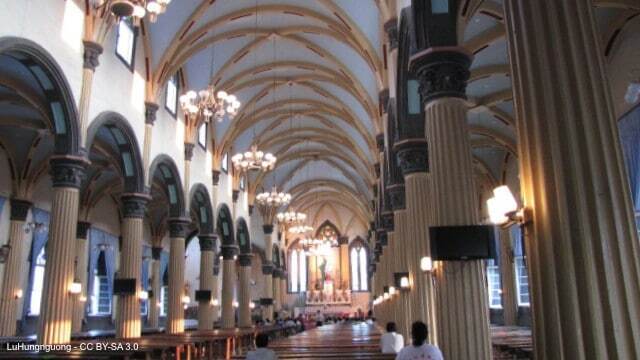 The Longtian Church is part of the Roman Catholic Archdiocese of Fuzhou, which the authorities designated an “illegal organization” in 1998. Since the beginning of this year, the institution has been subjected to increased and repeated harassment and intimidations. Several congregation sites in the area have been forcibly demolished or shut down, and the clergy monitored or detained. 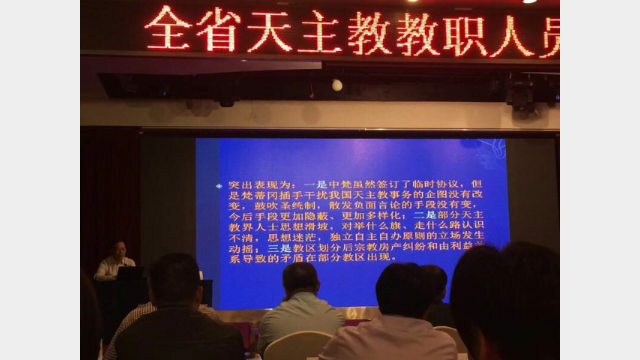 According to an informed source, the local NSB repeatedly summoned nine Catholic priests from the area of Fuqing city within Fuzhou for questioning on the grounds that they were “endangering public security.” Among other issues, the priests have been asked to share their views on the Vatican-China agreement. Another Fuzhou city priest hasn’t been able to travel out of China since October 2000. His crime? He took a photo with the Pope on a visit to the Vatican City almost twenty years ago. In August this year, he applied for a visa to Hong Kong, but the municipal NSB told him that he had been blacklisted by the Ministry of Public Security and was not allowed to leave the country. The priest revealed that the CCP not only forbids underground Catholic clergy from having contact with foreign Catholic groups but also forces them to join the Patriotic Catholic Association. On October 7, police officers forcibly halted renovation work at an underground Catholic church in Fuzhou’s Changle district. After failing to obtain permission from the authorities to rebuild the church, the believers started the renovation work as the church was in a state of disrepair and could collapse any moment. The authorities then threatened that the believers would be arrested and given a hefty prison sentence if they tried to rebuild the church. Village cadres have also been ordered to ensure that no construction work is undertaken at the site. The believers are now forced to convene at another old dilapidated building. On the same day, personnel from the United Front Work Department stormed into the Haiyan church of Fuzhou’s Jin’an district. They claimed that the church was “unlicensed and illegal” and ordered believers and priests to join the official Catholic body. Since then, officials from the department have visited the church thrice to carry out inspections. The crackdown on the underground churches is reinforced through indoctrination and propaganda activities. According to the website of the State Administration for Religious Affairs, the Ethnic and Religious Affairs Commission in Wuhan, the capital of Hubei Province in central China, held a training course for Catholic clergy on October 8-11. Over 80 priests, nuns, and regular believers took part in it. The Committee’s deputy director, Xiong Huaqi, spoke at the event. Calling Hubei “the first province with an independent Catholic Church in China,” he claimed that after the signing of the agreement, “the Vatican’s attempt to interfere with the internal affairs of the Chinese Catholic Church has not changed.” According to him, the attempts “will become even more sophisticated and diversified in the future.“ He then castigated Catholics for being confused about their principles and arguments regarding church property. The Chinese authorities have always persecuted the underground movement for refusing government interference in its work. In a case from 1955, 300 believers and over 30 underground priests, including bishop (later cardinal) Ignatius Kung Pin-Mei (1901–2000), were arrested in Shanghai for refusing to join the government-approved Chinese Patriotic Catholic Association. Cardinal Ignatius, deemed “counter-revolutionary” for defying attempts by China’s Communist government to control Catholics, was released thirty years later in 1985 but was kept under house arrest until 1988. He was eventually allowed to travel to the US for a medical treatment, where he died soon after. Underground and Patriotic Catholic Church: Merged in Two Dioceses?